The island appears suddenly, a fortress of lava black cliffs above a cobalt sea. An endless succession of long Pacific swells crash in crisp white spray at the base. The coastline is forbidding, for there are no safe anchorages and early navigators (Dutch Admiral Roggeveen in 1722, Gonzales de Haedo in 1770, Cook in 1774 and La Pérouse in 1886) found it extremely challenging to make landfall. Today Rapa Nui is administered by Chile. Approached by air, Rapa Nui resembles the lowlands of Scotland or the NSW Monaro, with gold green rolling hills pimpled by small extinct volcano cones. Copses of trees break up the landscape, and many of these turn out later to be eucalyptus plantations. Rapa Nui is situated midway between the Chilean coast to the east and from Tahiti to the west, 4,000 kms from each at latitude 27 degrees south and longitude 109 degrees west. It’s 24 kms long at its longest point and 18 kms at its widest point. Rapa Nui possesses two sand beaches, Anakena and Ovahe. The former is credited as being the landing place of the legendary Chief Hotu-Matua, probably around the 12th century, corresponding with the period of important Polynesian migrations in fleets of big, double hulled canoes. It is thought that Hotu-Matua came from the Marquesas. Thor Heyerdahl, who travelled to the island on the Kontiki in 1956 reported at the time of his visit that most islanders were living in caves. These were formed by water running through lava tubes, often resulting in huge, cool and roomy dwelling areas. Many “windows” open out onto the sea below, enabling the dwellers to fish virtually from their doorsteps. Many caverns are entered some distance away from the cliffs. Where the roof has fallen in, there are many sunken gardens, where people have planted an avocado, a couple of mangoes, taro and tobacco. They are fond of fishing camps and often take off into the campo for days. Interestingly, they avoid the sandy beaches, leaving them to the mainlanders and tourists, preferring to swim off the rocks. There is a shortage of standing fresh water on the island. Rain showers are short, sharp and furious and as the landscape is very permeable, water soaks straight through into the subsoil, often reappearing as freshwater upwellings in the tidal shallows, hence the peculiar sight of horses and cattle seeming to drink seawater. We were fortunately able to secure a wonderful guide, between cruise liners, to show us around the main sites on the island. The phenomenon of the moais has occupied much conjecture. Early ahus (stone platforms similar to the Polynesian marae) which carried shorter, round-headed statues, are carbon dated to 250 ± 800 AD. In a later period, around 1100 to 1680, the giant statues were erected. It is believed that they represent ancestors and that they possess supernatural power. At some point around 1680, evidence suggests that internecine strife broke out between two clans, the Long Ears and the Short Ears (so called because of the representative carvings on the Moai statues themselves) perhaps due to the devastation of the island’s resources due to overpopulation. The moais belonging to the vanquished were deliberately thrown down and desecrated. However this act of desecration was followed by another even more terrible in 1862 when all the oral and genealogical history and traditional lore, carried by the priestly class of Ariki was lost. Peruvian slavers in that year captured and took away more than half the population, at that time numbering about 3,000, to work in the guano mines on the mainland. Among the slaves were the King and most of the Ariki who are credited with having the mana to move the statues from one part of the island to the other. Following protests by the Bishop of Tahiti and the French consul general in Lima, the surviving few were repatriated. Tragically however they brought smallpox with them and the resulting epidemic decimated the remaining islanders. At the time of Heyerdahl’s visit on the Kontiki in 1956, only a few hundred families remained. The population now is 3,500 of which 1,800 are of school age. All of this detail we learned from our guide as we toured most of the Moai sites on the eastern side of the island. There are about 300 ahu on the island, and around a thousand giant statues, according to Father Sébastien Englert, who made an inventory during his ministry between 1935 and 1969. For numerous reasons I didn’t dowse any of the moai on site, but did attempt when possible to experience their energy field. The main statue quarry site of Rano Raraku is situated on the side of a volcanic crater consisting of grey basalt parent rock from which the statues were carved. Many moai never made it to their ahus and lie haphazardly, half-buried, in the ground. One of these figures does indeed closely resemble one of our elder statesmen! The moai were carved with stone tools, apparently by a special carver class of artisans. Recent attempts to recreate the carving of a moai in two days failed dismally, the carvers being unable to maintain the stance, hands over head, for sufficient time. Indeed they made only tiny indentations with the original obsidian tools. This suggests that the carver class may also have had mana. It is thought that they were second to the Ariki or priestly class, who did possess mana. Some of the moai have red tufa top-knots, thought to resemble an ancient contemporary coiffure. These are carved out of red tufa deposits at some considerable distance away, conveyed to the quarry and then custom-carved to ensure a good fit on each head. The topknots, each weighing about a tonne, and the statues were roped together then raised to the vertical, at which point special detail is added, such as fingers, loin cloths, petroglyphs etc. The eyes were thought to be ‘opened’ and activated after the moai is put in place on the ahu, when an eye made from white coral rock is placed in the newly carved eye sockets. Both my husband and I liked the Moai enormously. Each statue has a character of its own; some have long ear lobes, some short, some are thin, some stout. Their expressions are many and varied; insouciant, pugnacious, alert, pensive, stoned. It is hard not to feel fond of them. Overall however, having seen the quarry where so many lie half finished and abandoned, the thought arises that the whole exercise was stunningly futile, an endless ancestral replica assembly line which suddenly ground to a halt. Why not build a wonderful temple complex we wondered, with all that effort and expense? There is indeed evidence that stonework similar to the great temple complexes of Tihuanaco was erected, in particular at one ahu where the precise fit of the huge stone blocks invoked awe from my builder husband. Many fallen moai have been used as burial chambers, some quite recently, with deposits of skulls and bones fitted in beneath them and walled in with boulders. We also visited an ahu that had served for cremations. They were moved with mana. Are they still “active” when upright? Yes. They are not sacred before being moved to their site, but become consecrated by the Ariki when placed upright. The Egyptian priestly class also possessed mana and used it to move/construct pyramids. There is no direct connection between Easter Island and Egypt. There is a connection between the South American cultures and Easter Island. The Atlantean civilization had a part in this story. An important site we visited on the last day by rattletrap 4WD was Ahu Te Pito Kura, the Navel of the World. It is situated right on the seashore and consists of a large, perfectly rounded stone with four smaller versions placed at the cardinal points beside it. We saw with some interest that a elderly European tourist, who had rushed forward and sat on it, was told by the guide to get off in no uncertain terms. It is actually quite hard to get any information out of any of the locals, and I received the distinct impression that The Navel was (a) very significant and (b) they didn’t want to disclose anything. Luís, our host, did remark that some groups of foreigners do go out there to meditate. A local fisherman nearby was very vigilant indeed and kept a close eye on us after the other tourists had left. I knew of the site and of its significance as an important energy center. After seeking permission, I got out my pendulum and started dowsing! The stone itself was extremely hot in the midday sun, much hotter than the surrounding black lava rubble and boulders. It is heavily pock-marked, has a faint brassy sheen and appeared to be semi metallic. The four smaller stones were undeniably similar to it, and all are completely unlike their neighbours. 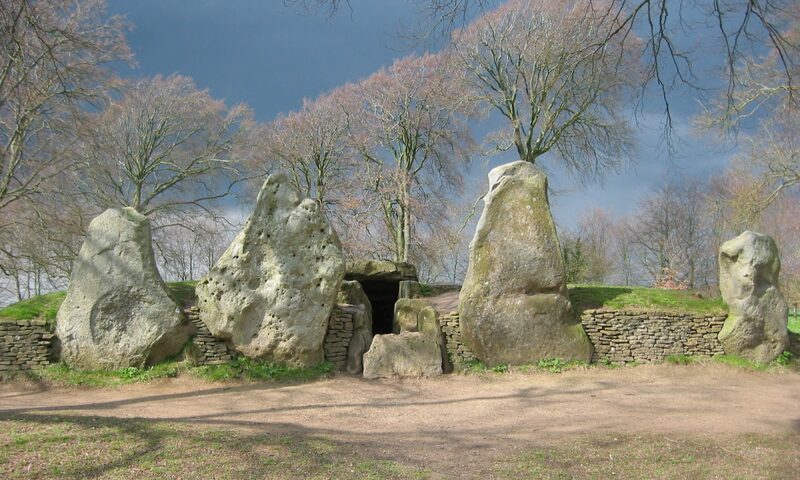 The big stone (diameter about 50cm) appears to be aligned with a positive polarity to the North, negative to the South, positive to the West and negative to the East. The center was neutral. I could not detect any field close to the stone, as the wind was blowing pretty strongly. The four smaller stones, (diameter about 20cm) were North positive, South negative, West positive and East negative. It was placed on Rapa Nui by the hand of gods, not of men. It is part of an energy grid that governs or affects the whole world. It has not fulfilled its entire purpose, which is yet to come. Yes it came from an off-world civilization. It is not connected to the Moai. It was worshipped at the time the statues were built. It is an artefact older than that civilisation. Time didn’t permit “is there anything more to consider?” sadly and I admit to being somewhat tongue-tied. It is not often that one gets the chance to commune with such an important entity. In six days on the Island we really only scratched the surface, but were fortunate enough to stay with local people who were wonderfully hospitable. The island is fascinating and now easily accessible via Tahiti. The culture is incredibly rich and there is plenty to occupy young and old, all the better if you speak Spanish. I’m very happy to answer any queries or help with contacts for accommodation or guides.